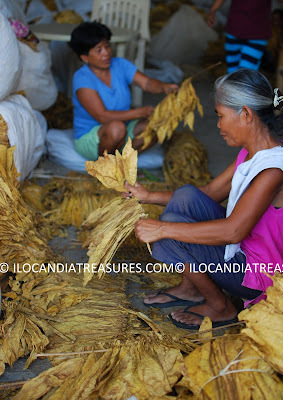 With the request of Governor Imee Marcos for possible materials necessary for a photobook project, my colleague in photography Andie Lamug and I went to cover and document the last batch of tobacco curing in the town of Pinili on June. We were lucky to have had the good timing for the rainy season was about to set in. We were even luckier to have met a family who was so accommodating. They generously posed for our pictorials. Andie set the lights and other materials necessary. They had shown us and explained to us the procedures on tobacco processing but we mainly focused on the curing. 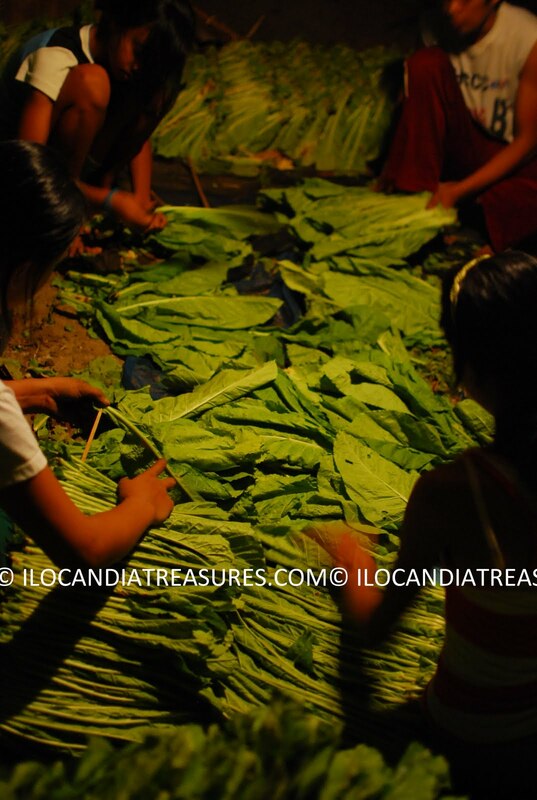 They harvest the leaves of tobacco with the term stripping or gatud in the Ilocano dialect. They start from under layers of the tobacco with huge sizes of leaves. They become smaller towards the tip. What we have seen were the smaller leaves. They were all collected and placed altogether in the barn. We started our documentation at this stage. The children of the family were incharged of pricking meticulously the leaves one by one with a bamboo spoke to group together and be able to hang them. 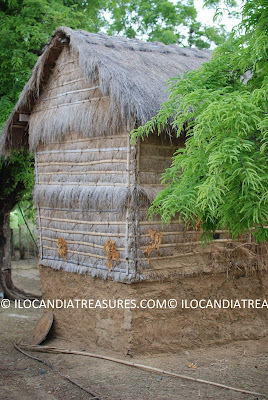 This stage is called the panagtudok in the vernacular. The young teens were happy doing the chore with some chitchat. The father came into the scene and he hung all the bundles of leaves at the kiln or pugon. He had to climb and started to fill up the topmost part until it got full down below. There was galvanized pipe that goes around the corners of the kiln and that when the hardwood was set into fire from the side of the kiln it gave a burning temperature inside that will enable to dry the leaves in about three days. 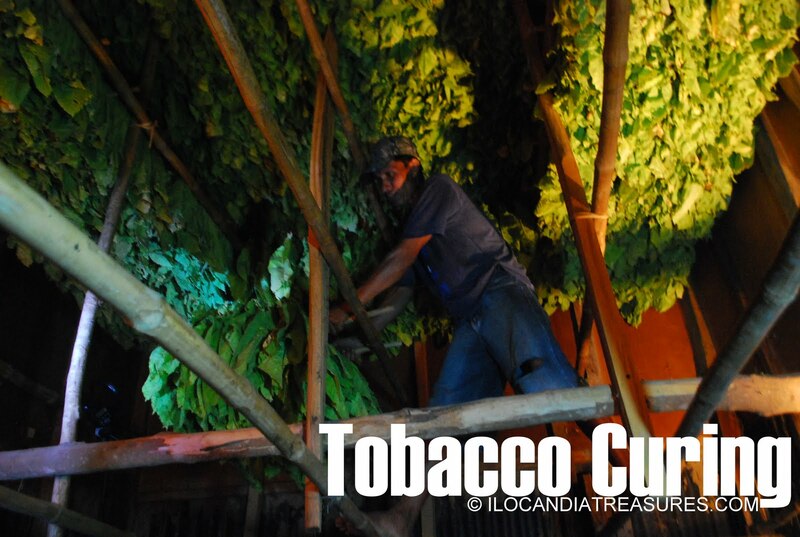 Fire-cured tobacco is hung in large barns. It is where fires of hardwoods are kept on continuous or intermittent low smoulder and takes between three days and ten weeks, depending on the tobacco. This procedure of fire curing produces a tobacco which is low in sugar and high in nicotine. The chewing tobacco, pipe tobacco, and snuff are fire cured. It was really a tedious task to cure leaves but with a photo shoot like this, they enjoyed every moment. They sell their dried leaves to a middle man who does the redrying and we were able to see loads of dried tobacco leaves in a warehouse in the town and can smell the aroma of tobacco. Immediately after the Walk for a Cause to Kapurpurawan in Burgos, parish priest Fr. Ronald Bonayon invited us to visit his resort just close to the Cape Bojeador on the bayside. Its been a long standing invitation to see this resort. We were initially taken to the fish sanctuary close to the resort where rock formations abound. Deep blue water can be seen and some fishes were apparent. This is the part where they cannot catch fish as per ordinance. He told us that he swims in this area. On the opposite side, fishing is allowed. Some boats were anchored on the shore. On the resort itself, some cottages or shed were built. The land is naturally filled with white sand. We were then led to the main building where rooms are available for occupancy. Fr Bonayon took us to the attic and it looks beautiful and cool. The roof is made of labig and floor is wood. The windows frame the wonderful sights and scenes of the nature outside. 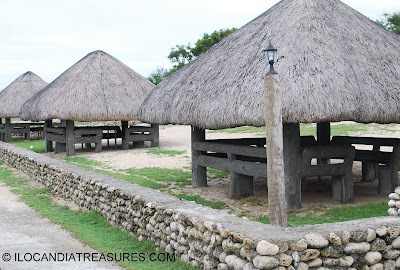 Fr Bonayon told us that this resort was built through his earnings from conducting retreat seminars and would like to share this resort to the public. Some finishing works are ongoing but it’s now ready for use. In celebration of the Environment Protection Month on June, Barangay Poblacion in Burgos, Ilocos Norte headed by Brgy. Capt. 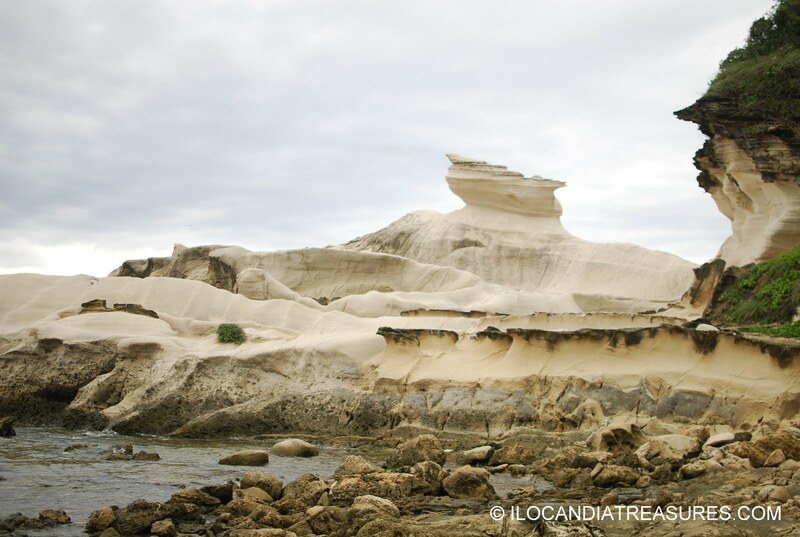 Joegi Jimenez organized a walk for a cause to Kapurpurawan Rock Formation. This walk had the objective of protecting and preserving the environment and the mother Earth in general. This is an awareness campaign for the people to know that there is a nature to protect. The theme of the celebration was Forests: Nature at your Service. More than one hundred people have participated in this event. There were young and old people who joined the cause. It was raining the whole afternoon and night before the morning walk so it was really good that the weather cooperated with this event. There was no more rain but the road was partly wet and muddy. The group started from the highway towards the Kapurpurawan Rock Formation. It was a one hour walk. A simple program was held at the site with the speeches of Brgy Capt. Joegi, Vice Mayor Rey Galano Espejo, Mayor Crescente Narciso Garcia, and the DENR people. The reiterated their advocacy for a clean environment and its protection and preservation. The highlight of the program was the signing of the covenant to protect Mother Earth by public officials and private citizens. The group had a photo-op in front of the amazing Kapurpurawan Rock Formation and a breakfast was served before everyone went back to the town.